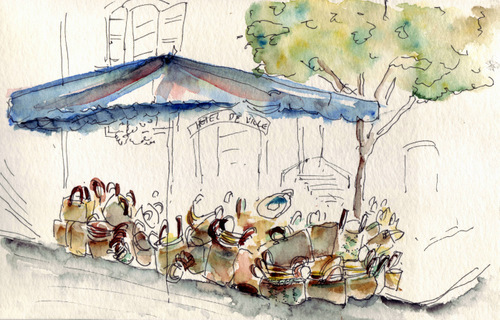 Sketching in august 3: Market scene. Sundays we spend either at a brocante or at the market in St. Cér2..and coffee and croissant of course! 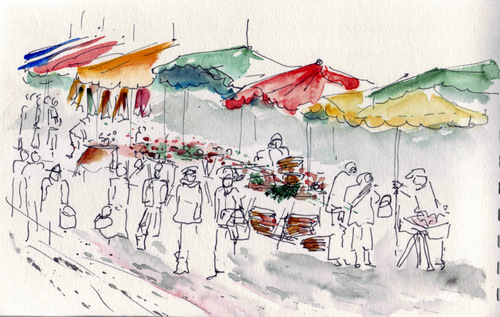 Today was market day in St. Céré with coffee. It was a crazy rainy day with the sun coming out every hour for 10 minutes before it came pouring down again. We sat at the corner café and while I sketched, mon chéri worked(played chess, I think!!) on his computer. I was happy with the sketch I did in pencil. 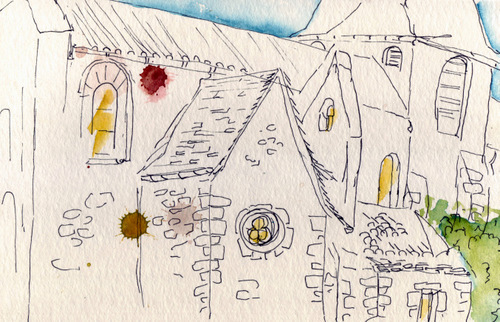 I should’ve only added pen and be done with it, but I couldn’t resist adding watercolour and it all changed…pity. ..pen and watercolor in Derwent artist’s sketchbook, 140x210cm..
..and the sketch halfway done, after the watercolor wadded but before the pen lines were added. 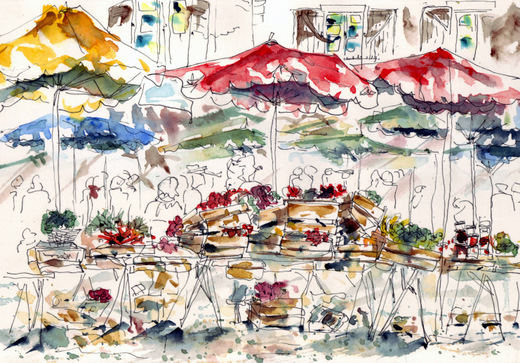 Sketch of a market day in Beaulieu sur dordogne. I took today off…apart from making my bed, I decide I am doing nothing else today. In terms of working that is. So I dressed myself pretty, put on some make up, which I haven’t done in ages. A dash of perfume…well OK, that I do every day, even when feeding the horses. But you know what I mean. A day where I ignore all kinds of “must do” lists and let the day run free. Yes, I know, I’m fortunate to be able to do it. So I took off to Beaulieu, not to open my gallery, on the contrary, I hung a notice…”gone painting” on the door. which is of course not the truth. I had many coffees, chatted with friend and foe, shopped at the market, ate a delicious “flamiche au saumon”, I paged through the cote Sud and cote Est and Cote Ouest, found inspiration and new ideas, and yes. I caught a sketch. Of the market. While sipping my third coffee. Poor Africantapestry is in some abandonment. Not completely, but just enough to make her feel a bit lonely. I hope (how many times have I said this already??) to get back to frantic activity soon….one day….hopefully very soon…!! So, to all those who follow in such good spirit, thank you for your patience and loyalty and hang in there, I’ll be back with gusto soon…one day….hopefully very soon! 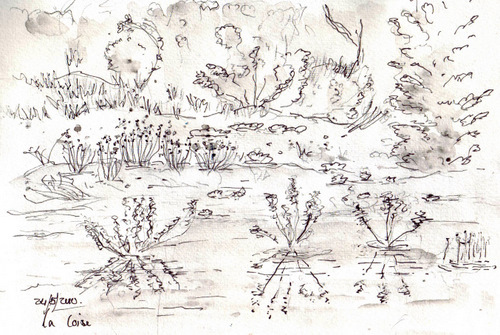 About two weeks ago, I went sketchersizing by the Loire at our Loire house and stopped only once for this pencil sketch, which I then added some ink lines to with an ever so slightly wash, because the pencil was too hard to get some feeling into the sketch. 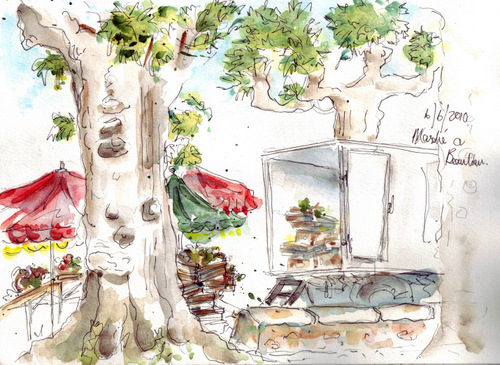 I went sketchersizing here in Beaulieu a few days ago and sat down just when the morning market started packing up for the day. I enjoyed a deca allongé at Les voyageurs with a view on the place and the marché. If interested in seeing some photos of the medieval town of Beaulieu, you can visit The Charming character of Beaulieu sur dordogne at Myfrenchkitchen. sketch done in pen and watercolor in watercolor sketchbook, 26x18cm..
Everydbody in our exchange group had already seen this scene posted on our FPP blog, and I just wanted to add it here too. 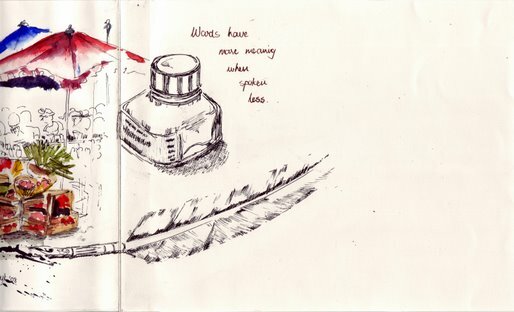 It was my contribution in Vivien’s book a while back. 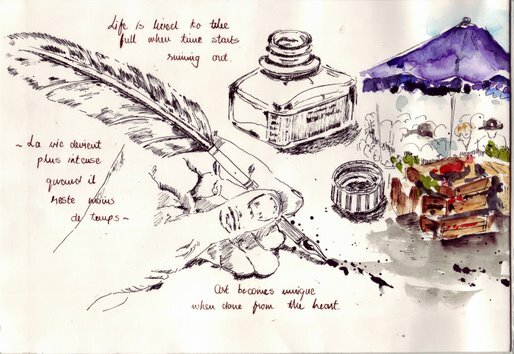 She ended her drawing with a lovely, soft, perfectly drawn feather and I picked up the feather cue from her. See Lindsay‘s creative continuation from here, posted on FPP by Robyn, and unfortunately you’ll have to wait a while to see how Robyn continued…but pop in at our FPP blog – the books are getting LONG and EXCITING and VERY creative. I have seen all of us getting looser and looser, more original, more creative, more daring, trying new materials and mediums, playing with collages, pasting and glueing, going for beautiful realisms to beautiful abstracts, pushing and challenging ourselves. A sketchbook exchange is a wonderful way to move a bit away from what we do normally in our art, “our signature work” so to speak and try out something different, still putting our own “signature” on whatever we do…pushing the envelope. I think that when this sketchbook exchange project is done, we’ll all look back, and discover that apart from the fun we’ve had, we will have learnt new ways, techniques and creative playing-around , grown in directions we wouldn’t otherwise have discovered…I know I will.